The market for single-use bioprocessing systems in Asia Pacific has witnessed an impressive rise since its inception and is expected to remain growing significantly, thanks to the rising adoption of single-use technology among small biotechnology startups and biopharmaceutical enterprises. As the biopharmaceutical industry is maturing, organizations across Asia Pacific are progressively focusing on finding innovative treatment solutions, which are not only different from their competitors, but also have a reduced pipeline for development that helps in bringing the product faster to the market. Since single-use bioprocessing systems allow biopharmaceutical organizations to speed-up the research and development activities and scale up the process from pilot level to production level for the manufacturing of biopharmaceuticals, with the added advantage of reduced investment and production costs, their popularity has substantially increased, which is reflecting on their demand. The rising usage of single-use bioprocess systems at the manufacturing stage in the cGMP production of biologics is likely to boost this market over the forthcoming years. 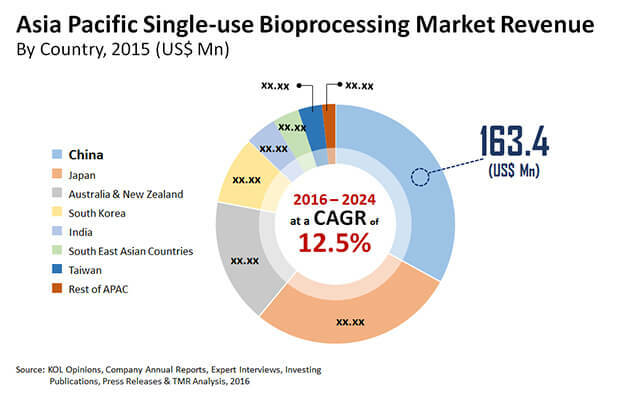 The Asia Pacific market for single-use bioprocessing systems, which stood at US$495.0 mn in 2015, is expected to increase at a CAGR of 12.50% between 2016 and 2024 and touch a value of US$1,417.2 mn by the end of 2024. Single-use bioreactors, mixers, bags, tubing, bioprocess containers, filtration devices, sampling systems, connectors and clamps, and probes and sensors are the key products available in the Asia Pacific market for single-use bioprocessing systems. The demand for single-use bags is higher than other products in this market. Due to the higher rate of product adoption in research labs and pilot scale bioprocessing plants, supported by their cost effectiveness, this segment is likely to remain witnessing strong growth over the next few years. Single-use bioreactors are also expected to witness healthy growth in their demand in the near future. Vaccine production, biosimilar, blood plasma products, cell therapy, and several other bio pharma products have emerged as the key application areas of single-use bioprocessing systems. Vaccine production segment has been reporting the most prominent demand for these systems. Researchers expect this scenario to continue like this in the near future, thanks to the acceleration in the fields of drug discovery and the increasing prevalence of chronic diseases in Asia Pacific. Geographically, the Asia Pacific market for single-use bioprocessing systems has spread across China, Japan, India, South Korea, Taiwan, Australia and New Zealand, South East Asian countries and the Rest of Asia Pacific. In 2015, China led the overall market with a share of 33.0% on the grounds of new product launches. Over the forthcoming years, the domestic market is likely to remain on the top, thanks to the presence of a large pool of players. Japan stood second in the Asia Pacific market for single-use bioprocessing systems in 2015. Expanding at an exponential growth rate compared to other domestic markets, it is likely to witness a high rise in its market share. The increasing demand for cost effective and prefabricated modular bioprocessing facilities, introduction of new products, and the expansion in the pharmaceutical and biotechnology industry are expected to boost the Japan single-use bioprocessing systems market in the years to come. At the forefront of the Asia Pacific market for single-use bioprocessing systems are Danaher Corp., Eppendorf AG, Finesse Solutions, GE Healthcare, Colder Products Co., Merck KgaA, Parker Hannifin Corp., CESCO Bioengineering Co. Ltd., Saint-Gobain, Sartorius AG, Corning Inc., Thermo Fisher Scientific Inc., and Cole - Parmer Instrument Co. LLC.